Forget those serene manger scenes on Christmas cards. It's a very merry Odyssey Christmas as Eugene and all your favorite characters learn what Christmas is all about in wild, wacky and often touching ways. A Christmas Odyssey features twelve beloved Adventures in Odyssey episodes on four CDs, for over four hours of Christmas cheer.Exclusive "Christmas Letter from Whit" inside package and Fun Facts about how the shows were created. Forget those serene manger images you see on Christmas cards. A Christmas Odyssey revisits the Christmas story as Connie and Eugene crash Bethlehem for Jesus' birth. Silent Night? Hardly! Then zoom back to the present for a Kids' Radio reenactment that's too close for comfort: Mary goes into premature labor! There's enough drama to go around for several Christmases. Or multiple replays. Whichever comes first. Q: difference What is the difference between this christmas odyssy and the christmas classics? 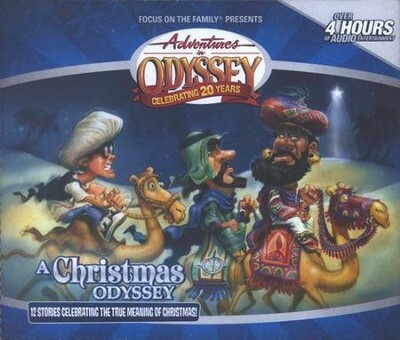 These two "Adventures in Odyssey" Christmas CD sets feature completely different shows. Check the "Back Cover" view listed under the social networking icons on each product for a list of the included episodes. 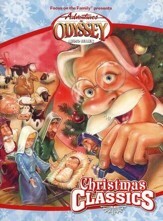 I'm the author/artist and I want to review Adventures in Odyssey ® A Christmas Odyssey.